The Wonderful Story of Britain: The Good Laws of King Henry the Second. 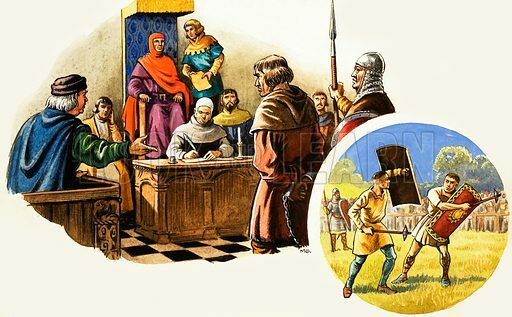 Henry II listens to the grievance of a humble subject, while his courts dispense justice through trial by jury, though lesser courts still used trial by ordeal, in this case by battle or combat. Original artwork from Treasure no. 41 (26 October 1963). Available worldwide for immediate download up to 5,081 x 3,149 pixels.